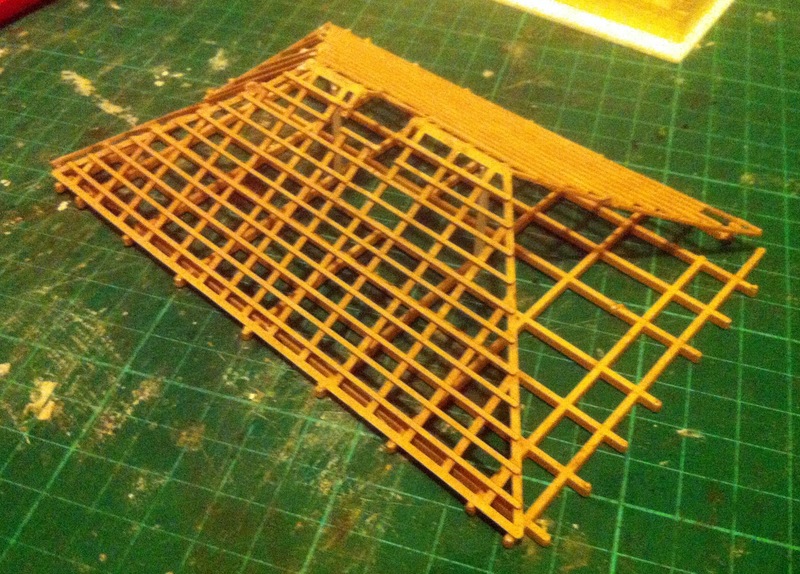 This is the third part of my attempt to turn a HO scale railway building into a useful bit of wargaming terrain. Here are parts one and two. The next stage was to cut some strips of corrugated card, slice them into smaller pieces, and glue them onto the roof. Next, some paint. I undercoated everything (rather poorly) with a mid-grey then painted the roof timbers with raw umber and the roof panels with silver. I slapped on some raw umber and black where I wanted the wood to look fire-damaged, and washed the same colours over the roof panels to weather them. When everything was dry I drybushed more of these colours here and there to represent smoke and soot. Very, very nice, and inspired! Thanks for sharing! Great work. I've just started a 15mm first/second Chechen war project and am presently making tower blocks from cake dummies for a semi-urban board. What rules are you going to use? I'm thinking of modding Crossfire, as set which I've very much enjoyed in the past. Your armour also looks fantastic too. I look forward to future posts! Thanks everyone! Gareth, I had to look up cake dummies - they look like a great way to make tower blocks. As it happens, I've already played a couple of modern games using Crossfire and it works well. I'm afraid I can't remember where I found it, but somewhere online there are some Crossfire house rules for Vietnam that might be useful to you.